Poland with its Dismembered Provinces, Drawn from the Best Authorities. 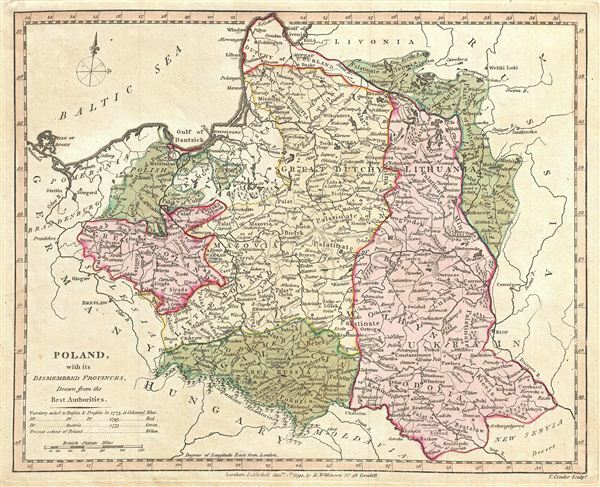 Robert Wilkinson's finely detailed first edition 1794 map of Poland. Covers Poland, Polish Prussia, Lithuania, and Ukraine. This map follows the Polish boundaries as set by the Second Partition, 1790. Shortly before this map was issued, Russian forces under Catherine the Great, citing a rise of radical French Jacobinism in the region, invaded the Polish-Lithuanian Commonwealth incorporating it into Russia's rapidly growing empire. This act, as well as other events, including the 1794 Kosciuszko Uprising, eventually lead to the third partition in 1795. engraved by Thomas Conder for the 1794 first edition of Robert Wilkinson's General Atlas.